In Kirk Douglas’s autobiography, The Ragman’s Son, I read where Douglas did a lot of his own riding and gun twirling in several of his westerns and so I rented those films and was amazed at his skill and agility. Then I got to the chapter on the making of The Vikings (1958), and I found a stunt in that movie that deserves the award for 1958. The director Richard Fleischer and Kirk Douglas wanted the movie to be as authentic as possible and so they did quite a bit of research to do this. Through his research about the Vikings, Fleischer had found a Viking game that probably had not be done in thousand years, ‘Run the Oars’. He hired a couple of stunt men to perform this hazardous act. The rowers were to hold their oars straight out from the boat. Kirk Douglas’ character Einar is to climb out on an oar and then walk or jump from one oar to another, without falling into the ice cold water. When Douglas saw the stunt men exercising this, he immediately insisted to do it himself to the horror of Fleischer. Without practicing, Kirk told them to roll the cameras and then proceeded to run back and forth several times on the oars. Douglas performed it impeccably. “You needed to get a rhythm going, keep the momentum from oar to oar. If you slowed down, you had time to lose your balance,” Douglas wrote in his autobiography. At one point when he did fall in the icy water he calmly swam over to the camera boat and asked if they had gotten enough good shots. He then swam back to the Viking longboat. Only in an interview given shortly after the release of the film did Kirk Douglas admit that the water in the fjord was just above freezing and the air temperature was only slightly warmer. He never complained. 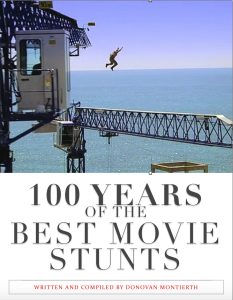 The movie is excellent and if you haven’t seen it, there are plenty of other great stunts and action scenes. 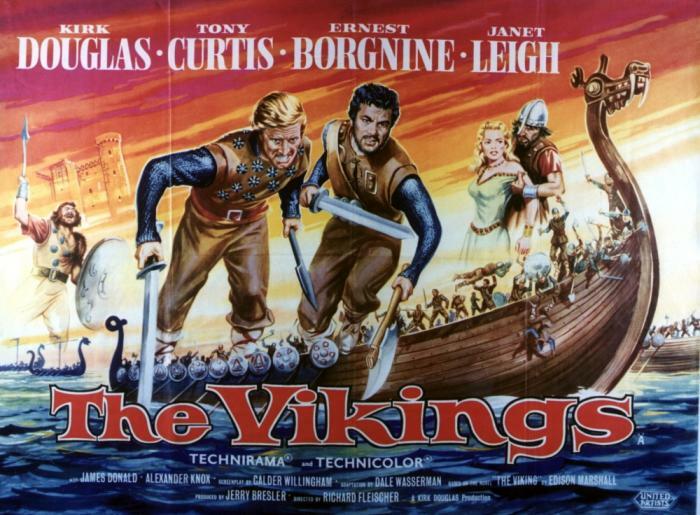 The Vikings was directed by Richard Fleischer for United Artists. Glossary of film terms as defined by the Wikipedia: Historical Drama or Epic – They are expensive and lavish to produce, because they require elaborate and panoramic settings, on-location filming, authentic period costumes, inflated action on a massive scale and large casts of characters. Biographical films are often less lavish versions than this genre. They are often called costume dramas, since they emphasize the world of a period setting: historical pageantry, costuming and wardrobes, locale, spectacle, decor and a sweeping visual style. They often transport viewers to other worlds or eras: ancient times, biblical times, the Middle Ages, the Victorian era, or turn-of-the-century America. Stuntman Spotlight: Douglas Fairbanks Sr.